I've only just heard the tragic news that the great Swedish piano player Esbjörn Svensson died a few days ago aged 44 on the 14th June 2008 in a scuba diving accident in Stockholm. I'm a big fan of the EST record 'Viaticum' and was lucky enough to see the group play at the Bridgewater Hall a few years ago. Very sad news indeed. I caught the last set of Matt Halsall's gig last night at Matt and Phreds. 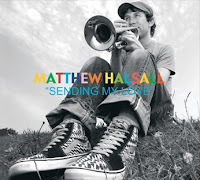 It kicked off with a punchy rendition of 'Sending My Love', a tune I particularly like and one of the tracks on Matt's fab new CD of the same name. You can now buy the CD from his also brand new Gondwana Record label. The website shop isn't live yet so you'll need to email the label to get a copy at the moment. The band line up now frequently includes a harp and last night there was some exquisite playing from Rachael Gladwin. She treated us to gorgeous extended solo introduction to the Cinematic Orchestra classic 'Ode to the Big Sea' making for a beautific and rousing end to the set. Some tasty Tranesque playing from sax player Nat Birchall warmed the ol' cockles nicely too. I also bumped into Manchester Jazz Festival marketing maestro Fanny Guillaut down there, which reminds me I should mention that the full programme for the festival is now listed on the mjf website. I'll do a proper festival preview taster in another post I think. The mjf also has a MySpace page and Facebook group you can join if you prefer these alternative modes of communication. The jazz festival is the highlight of the North West jazz year and is always a brilliant week. I remember chatting to Cinematic Orchestra drummer Luke Flowers last year and he was enthusiastically comparing the festival vibe to what New York must have felt like in the 50s and 60s. I suggest you go study the website this minute and get the festival week (18th to the 26th July) blocked out in your diary right now if it isn't already.